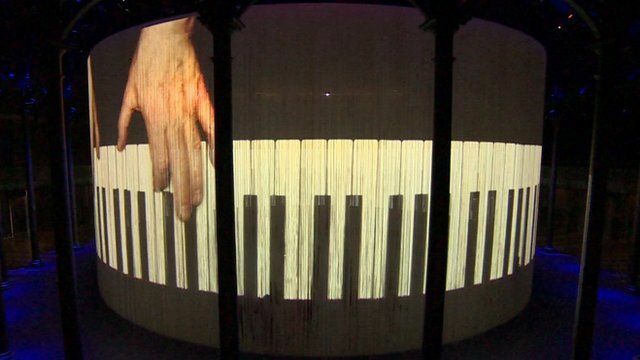 5,600 silicon rods create live curtain Jump to media player Artist Ron Arad returns to the Roundhouse in London with a 360-degree installation called Curtain Call. Icelandic performance art comes to UK Jump to media player Icelandic performance artist Ragnar Kjartansson is holding his first major exhibition in the United Kingdom. Has Damien Hirst's art been leaking gas? Jump to media player Will Gompertz explains claims that Damien Hirst artworks have been leaking gas. Street art tackles social issues Jump to media player Manchester's Northern quarter is transformed with a series of street murals as part of a new arts festival called Cities of Hope. Artist Ron Arad returns to the Roundhouse in London with a 360-degree installation, Curtain Call. The floor-to-ceiling artwork is made up of 5,600 silicon rods which provide a canvas for films and live performance.